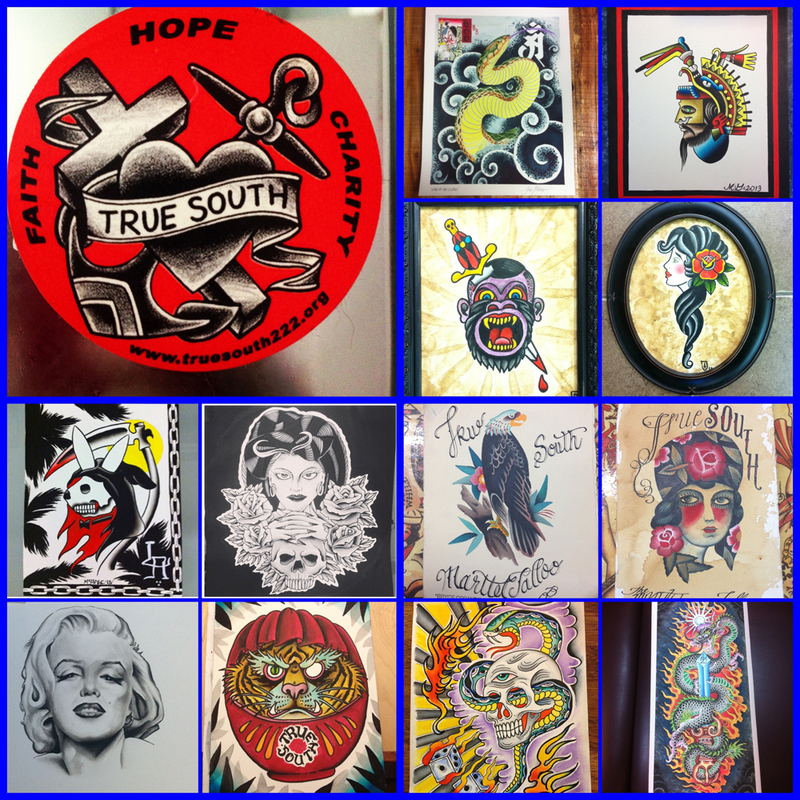 Courtesy of True South: True South will be having an online auction of original art, prints and tattoo machines beginning Jan. 15th to help raise funds for our friend Woody who was recently in a mountain biking accident. More info to come. Artists works from: Tim Hendricks, Josh Arment, Jordan Teear, Erik Gillespe, Jason McCaffe, Todd Nobel, Nick Colella, Eric Perfect, JoJo Ackermann, Carl Hallowell, Matt Arriola, Bubba Reeves, Oliver MacIntosh, Tom Moser, Eric Jones, Ross Nagle, Dave Cavalcante, Lindsey Carmichael, Jud Ferguson, Thomas Kenney, Jon Miro, Beau Brady, Greg DeHoot, Little Linda, Dan Smith, Carlos Rojas, Chris Stuart, Juan Puente, Ben Mack, Raking Light Projects and more... Woody is co-owner of local Silver Lake business, the Golden Saddle Cyclery. He is the shop's mechanic as well as the USA Olympic cycling teams mechanic and avid cyclist. He was on a trip in Arizona and while mountain biking clipped a step on a downhill and down he went head first and his collarbone took first impact and the bike flew over his head with one clip still locked in resulting in broken femur and hip. The most unfortunate part of this is he has a baby on the way due anytime between now next few weeks and because of the pregnancy his wife is also unable to work... Being a local small business owner myself I understand and fully sympathize for him and want to do what I can with True South to help. If you would like to share funds outside of the auction to help Woody, we have set up a PayPal: woodyridesagainfund@gmail.com. Again thank you everyone involved and all my best. Visit True South Relief Fund for more info at www.Truesouth222.org. Please repost and share this event with your friends and family!